SustainabiliTank: The Inspiration for a 21st Century Democratic Freedom Fighter par excellence – Nelson Mandela (1918-2013) – the Creator of a new Nation in South Africa – who passed away just a few days after the release of a film about his biography. an update. The Inspiration for a 21st Century Democratic Freedom Fighter par excellence – Nelson Mandela (1918-2013) – the Creator of a new Nation in South Africa – who passed away just a few days after the release of a film about his biography. an update. Mandela’s friend and fellow freedom fighter wrote this towards the end of his own life. He did not live to see it published but it remains a worthy tribute and a revealing portrait. Some call it a true obituary. The Thanksgiving part dealt with memory of thanks for affluence to which were invited also the surviving colored neighbors that had not been exterminated, killed, deported or just chased away. The Chanukah part reminds us of cleaning house from those that chased us away from our own homes, and the fact that we managed to do nevertheless well with what we found. How nice if history could have been different and the new start was with a Mandela vision? The unforgetable about Mandela the image, is his coming out of prison with a message of reconciliation rather than the obvious triumph of a universal force of gale size. In the movie this is refined in essence by his jailer bending to tie his shoelaces when onto what was already accepted as his victory visit with de Klerk. With his halting voice and friendly demeanor, Mandela had s spine of steel and ould not allow anyone to temper with his vision. The 2.5 hours Mandela movie is based on excerpts from Mr. Mandela’s autobiography that tells the complicated story of his life, from a childhood in a tiny rural village to his slow immersion in the struggle against apartheid, his leadership of the African National Congress, his 27 years in prison, and his eventual resurrection and triumph. My wife read the book but I had the honor to meet the man. That was when he was already the new President following his old scheme – building the new Nation of South Africa. I was lucky to go on a trip organized by a South African finance and law company that intended to show the business World at large that there is continuity in South Africa and that its new economy can be trusted. Nelson Mandela stood there and received the visitors in a huge tent that was set up on the grounds of a hotel outside Johannesburg – squinting in the light – and we were told not to take photos with flash as his eyes were hurt by the dust of the quarry he was working and breaking up the carbonate stone. Mr. F. W. de Klerk, the outgoing President, was also there and showed unity. A few days later it was Walter Sisulu, one of those that went to prison with Mr. Mandela, and Govan Mbeki (father of the Second South Africa President after Mr. Mandela) he took us through Robben Island outside Cape-Town. I also was at the opening of the Parliament and sitting in the balcony saw Winnie Mandela downstairs in the pit as she was elected to that first Parliament – all eyes on her. Later we had also separate meetings with the two Mbekis and with Cyril Ramaposa who was another candidate for the eventual succession. Seeing now this excellent movie that manages to chose from the book episodes that when strung in a narrative manage to show the evolution of the super-man Mandela without blushing that he was mere blood and flesh – a normal human with feelings. But let me say that I write this posting not because I want to say that God was presented as man – not at all. To me Mandela signifies something really above mere mortals. I do not see just the Long Walk to Freedom in the evolution of one man – not even of a group of suppressed people – but rather a Promethean Figure that set out to help all men – it is the Long Walk To Freedom of Africa and of all those other places where man bites man. The highlight of the movie is when Mandela tells de Klerk that he gets him nothing in exchange for being set free – the reward for de Klerk is in the actual act of letting him just walk out – this because he is not out for revenge but rather for the continuation of the process of building towards the humanism in the color blind equality and democracy of one man one vote. Mandela and de Klerk got together the recognition of the Nobel Prize for having jointly ended apartheid – this by Mandela taking on the extremists that were out to get revenge for those terrible indignities of the past. What was more important to him was to have a New South Africa that starts from ground-rules of rejection of any kind of racism, and of feelings of revenge as well. Our view is that the world needs more Mandelas – some of them sprinkled on the Middle East, on the UN, over East Europe – and some kept in reserve as potential Gurus for enlightenment for locations that need them. Walking tonight on East 38 Street in Manhattan, I saw on the sidewalk, in front of a building that houses some New York University offices, jars holding flowers stationed on top on notes saying this was the greatest man of our generation … A 31 year young Afghan-American who saw my surprise told me – yes – he passed away about 5 pm our time. By now every important person in the world got to make a statement about the passing away of the Madiba. 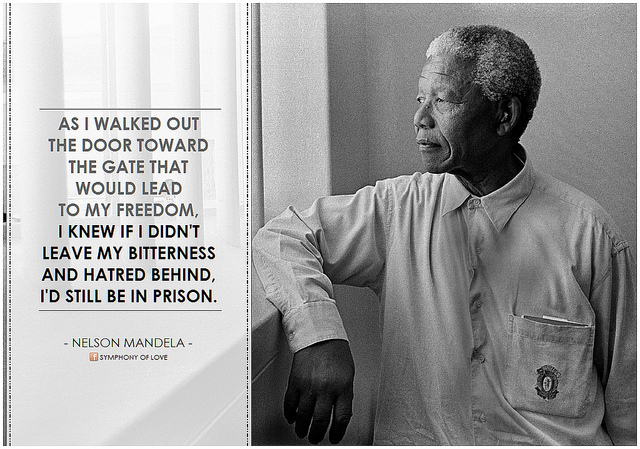 Madiba’s ‘long walk to freedom’ gave new meaning to courage, character, forgiveness, and human dignity. Now that his long walk has ended, the example he set for all humanity lives on. He will be remembered as a pioneer for peace. There are some truly brave people in this world whom you meet and you’re forever changed for the experience. Nelson Mandela remains Teresa’s hero, and a person who inspired her as a young woman to march with her classmates against apartheid. We had the honor of sitting with Mandela over the Thanksgiving holidays of 2007. I was struck by how warm, open, and serene he was. I stood in his tiny cell on Robben Island, a room with barely enough space to lie down or stand up, and I learned that the glare of the white rock quarry permanently damaged his eyesight. It hit home even more just how remarkable it was that after spending 27 years locked away, after having his own vision impaired by the conditions, that this man could still see the best interests of his country and even embrace the very guards who kept him prisoner. That is the story of a man whose ability to see resided not in his eyes but in his conscience. It is hard to imagine any of us could summon such strength of character. Nelson Mandela was a stranger to hate. He rejected recrimination in favor of reconciliation and knew the future demands we move beyond the past. He gave everything he had to heal his country and lead it back into the community of nations, including insisting on relinquishing his office and ensuring there would be a peaceful transfer of power. Today, people all around the world who yearn for democracy look to Mandela’s nation and its democratic Constitution as a hopeful example of what is possible. Teresa and I join those from around the world in honoring the life of this great man. Our deepest condolences go out to his wife, Graça, his family, all the people of South Africa and everyone who today enjoys the freedom Madiba fought for his entire life. Nelson Rolihlahla Mandela has died. Surrounded by close family members, the 95-year old succumbed to a recurring lung infection at home in Johannesburg, South Africa. The former South African president had been receiving treatment for the infection at his home after spending close to three months in a Pretoria hospital earlier this year. His battle with the infection was said to be a result of the tuberculosis he contracted in the 1980s while working in the prison quarry on Robben Island. Named by his father, Rolihlahla was born in Mvezo, a small village in the eastern part of South Africa, on July 18, 1918 – a day now commemorated annually as International Mandela Day. Rolihlahla literally means pulling the branch of a tree, and informally, it means troublemaker. It was only on his first day at school that he was called Nelson – the name was given to him by his teacher as it was common practice to give African children English names. He was later referred to by at least 4 other names – including the more popular ones: Madiba (traditional clan name) and Tata (a term of endearment meaning “father”). There was also Khulu (meaning “great” and “grand”) and Dalibhunga (the name given after undergoing the traditional Xhosa initiation. It means “founder of the council”). In the early 1940s, having just enrolled for his LLB at Wits University in Johannesburg, Mandela became one of the founding leaders of the African National Congress Youth League (ANCYL). It was during that time that he married his first wife, Everlyn Ntoko Mase, with whom he had four children. Mandela kept busy over the next decade and right through the fifties. He he was elected president of the ANCYL in 1951, the same year the Defiance Campaign against unjust apartheid laws was presented. It was officially launched the following year, and resulted in more than 8,000 activists, including Nelson Mandela, being arrested for refusing to obey apartheid laws. A year later he and Oliver Tambo opened the country’s first black law firm, ‘Mandela and Tambo’s Attorneys’, in Chancellor House, Johannesburg, where they provide low-cost and sometimes free legal services to black South Africans. In 1956 he was among the 156 people arrested on charges of treason – Tambo left the country and remained in exile. In 1958 Mandela divorced Mase and married Winne Madikizela Mandela, with whom he had two daughters – Zenani and Zindzi. A tipping point came in March 1960, when thousands marched to a police station in Sharpeville to demonstrate against having to carry pass (identification) books at all times. By the end of the day 69 were killed by police. Soon after, the ANC was banned but continued its work underground, and the country was in a State of Emergency. The period saw a change in usually peace-loving leader. The following year he co-founded the armed branch of the African National Congress (ANC) called Umkhonto we Sizwe (MK) along with Oliver Tambo and other anti-apartheid fighters. He spent months on the run, and left the country soon after to undergo military training in Algeria. Shortly after his return he was arrested and charged with incitement and leaving the country illegally. He was also charged with sabotage along with 9 others in what would later lead to the infamous Rivonia Trial in 1963. He would ultimately be sentenced to life imprisonment. In the 1980s, a worldwide campaign gained strength, urging South Africa’s National Party to release Mandela, but under the restrictions of then-president P.W. Botha—that included Mandela renouncing violence as a means of protest and change—the ANC would not agree to these terms and Mandela was refused release. When F.W. de Klerk became South Africa’s president in 1989, he announced Mandela’s unconditional release. Mandela finally left prison on 11 February 1990. After nearly three decades behind bars, Mandela took over as president of the ANC in 1991, leading the party – and country – through a tumultuous time of transition from apartheid into democracy. As the elected leader of the African National Congress, Nelson Mandela ran for president in South Africa’s 1994 elections, winning the ballot to become the country’s first black and democratically elected president. He led the country for five years, working to make broad moves to unite the country’s fractured black and white populations. He stepped down in 1999, refusing to run for a second term. The Nobel Prize winner is survived by his wife, Graça Machel who he married on his 80th birthday in 1998, Makaziwe Mandela (his daughter from his first marriage to Evelyn Ntoko Mase), Zenani and Zindziswa Mandela (his daughters from his second marriage to Winnie Madikizela-Mandela), 17 grandchildren, and 13 great-grandchildren.